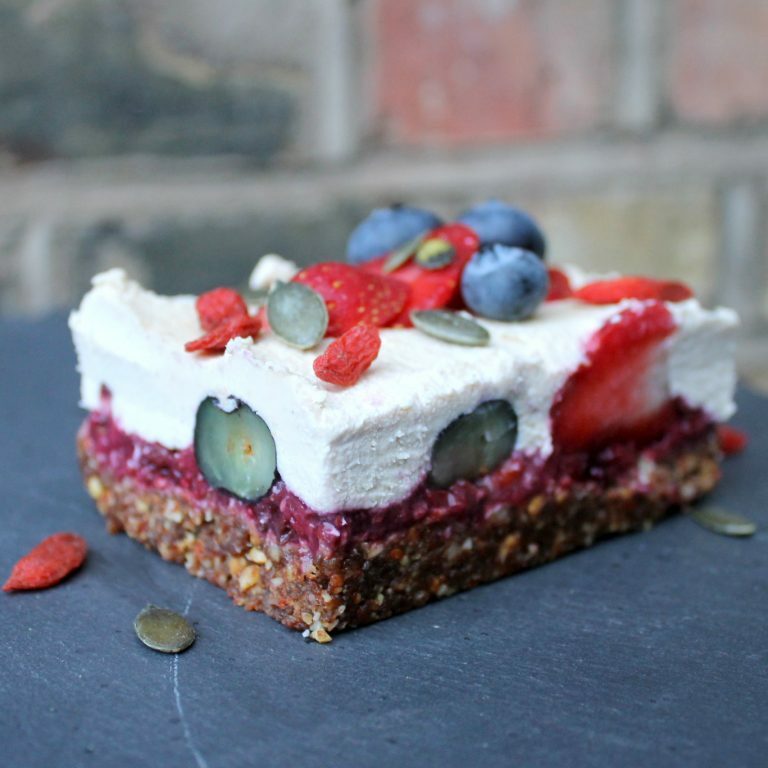 This is without a doubt the easiest, quickest, most DELICIOUS healthy vegan berry cheesecake recipe EVER! Cheesecake is one of those deserts which actually gets even more yummy when you make it vegan, thanks to the wonderful cashew nut. The only drawback with creating a full on vegan cheesecake however is the huge volume of nuts and dates and other ingredients which you need to have stocked up in your cupboards ready to pulverise into something delicious, which can be way too much hassle for those cheesecake emergencies after watching old episodes of The Bake Off in your PJ’s at 11pm at night. But, cheesecake fans, there is hope. Having a few Squirrel Sisters bars in the cupboard totally does the job, as you can easily whip yourself up a Mary Berry grade treat without having to have a casual kilo of medjool dates lying around your kitchen. The bars are pretty much a ready made base, just waiting to be topped with some creamy cashew cheesecake dreaminess. How handy is that?! First of all, you need to soak your cashews, so get them in a container and cover in water. They're fine soaking in the fridge, but remove an hour or so before you want to make your desert as it work so much better with room temperature ingredients. Take your Squirrel Sisters bars and break them up into your processor. 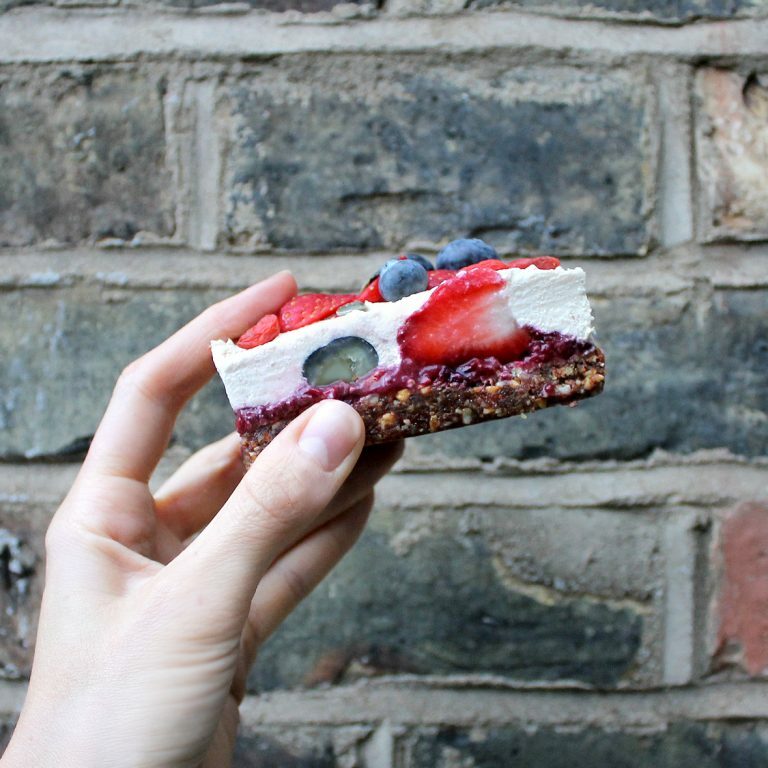 Whizz up until they go into crumbs - if you're adding the toasted buckwheat (it just gives it a little extra crunchiness to the base) then do that now, and add the little bit of coconut oil to give it all a hand binding back together. Scrape all the base mix into a small tray or a mould and press down to compact - I happened to have some really handy little rectangle moulds for this, but you could use anything, like a small baking tray, a teacup or small bowl, get creative! A top tip is if you're worried your slice might get stuck in the mould then line it with some cling film with lots of extra at the sides, so you can pull it out when the time comes. Pop it in the freezer while you do the next bit. Then, chop your berries and heat in a pan with the chia seeds for about 10 mins, until you get a jam-like compote. Allow to cool. Layer the compote on top of the base layer which has already started chilling. After 10 mins or so add the cashew creamy layer, and pop in some decorative blueberries too if you fancy.